A PLUS AVIONICS give operators of aging business jets the opportunity to remove all of their old CRT screens and old gauges with modern liquid-crystal glass displays. 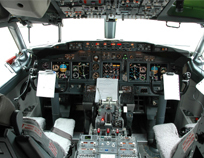 We give the operators the chance to have a complete make-over on their avionics systems. A PLUS AVIONICS offers cost effective glass cockpit modernization solutions while complying with the highest standards of quality assurance. By consolidating primary flight data on easy-to-view electronic displays, these integrated Glass cockpit solutions offer added functionality and reduced pilot workload as scan across multiple instruments is minimized. With the average age of aircraft now passing 15 years, the avionics technologies originally installed represent 20-year-old thinking… and multiple opportunities for owners to enhance safety, pilot efficiency and most importantly, reduce operational overhead. A PLUS AVIONICS is the obvious choice for glass cockpit retrofitting, given the advantage of our extensive instrumentation sourcing capabilities which ensure cost savings while complying with the highest standards of quality assurance. Installing a new cockpit in a business jet is an added value because it makes the aircraft more marketable when it comes the time to sell it. Aircraft that received avionics upgrade or cockpit retrofits are more promising to be sold than those which still have their old original avionics systems. Sellers could certainly recoup the cost on the avionics upgrade on this manner.